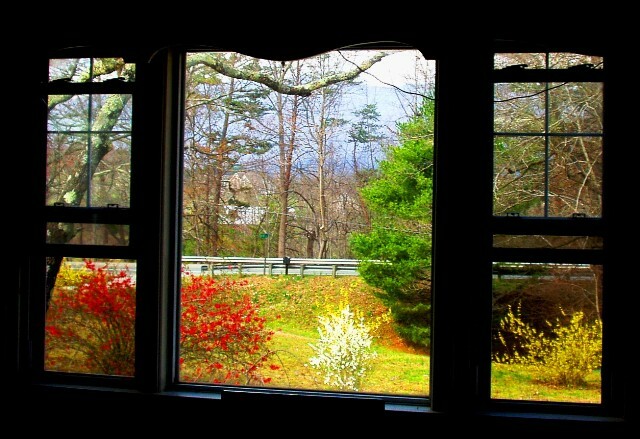 I look out my open living room window and see bright spring color. A breeze, still cool, but warm enough to hold the promise of April’s temperatures touches my face. Our weather comes from the west and this is the coldest room in the house, but my view is cheerful. The trees, bare, just days ago are full and ripe with bloom. The red-pink of japonica, yellow of forsythia, and white of bridal wreath vie for attention with the purple of crocus and the lavender of violets. Days are longer. People whistle walking down the sidewalk, and smile. 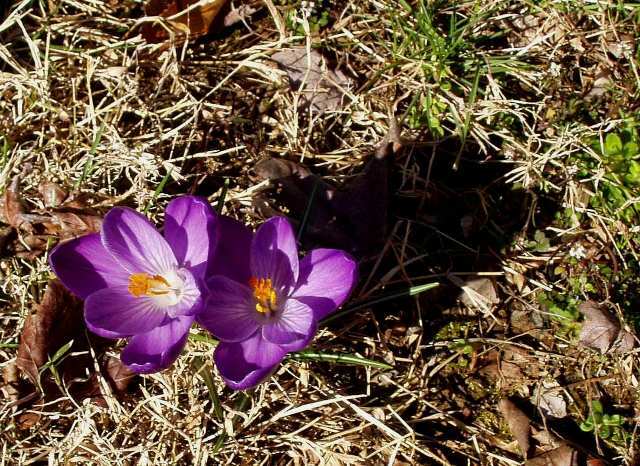 It’s the first full day of spring. Sometimes, in years past it’s been so cold the first day of spring that only the resilient daffodils show their colors above the snow on the ground. This year the season came early. Dogwoods will bloom well before the town festival and the Bradford Pears have already begun to shed their blossoms. The early birth seems to be pushing time forward for me, pulling up that hope still dormant in me. It’s Wednesday and I know in two more days I’ll see my father. I can’t help but wonder how much thinner he’ll look this time, how much of his hair will be gone, how bent he will be over the walker. I know how he sounds. I talk to him every night. His voice is scratchy and ancient. His breathing is labored. He’s scheduled for a blood transfusion tomorrow. Those make him feel better. I pick up the phone and make the nightly call. The phone rings and rings, then the line connects. “Can I call you back in ten minutes?” Bev’s harried voice asks as soon as she picks up the phone. Something is terribly wrong, I know it. I pace the floor, looking at my watch every thirty seconds, trying to push the time forward by the sheer force of my will. He’s stopped breathing, I think. He’s fallen again. His temperature has reached that critical one hundred seven degrees that sends you into brain damage. I can see her pouring ice cubes over him to cool his hot skin. I can see his eyes rolling back in his head. When the phone rings exactly eighteen minutes later, I am breathless. “Hey,” I say. “How’s he doing?” I ask. I’m glad to hear his appetite has increased. The last time I’d seen him he said everything he ate tasted like cardboard or worse. Even fudge ripple ice cream, his favorite, held no appeal. Now he was eating yogurts, peanut butter sandwiches, apple slices, and pretzel sticks. My spirits lift. “Here’s your Dad,” Bev says, handing the phone to him. “Hi daughter,” he rasps to me. “Glad to hear your appetite’s better,” I say. “Things taste more like they’re supposed to. We stopped on the way home and got a hot fudge sundae.” I imagine him sitting in the car, spoon to mouth, eyes closed, savoring his ice cream. It makes me smile. I think I’ll cut some japonica, forsythia, and bridal wreath from the bushes, put the branches in a vase, and carry them to Chesapeake with me. It seems a little early spring is good for the spirit. My decal man finally worked me into his schedule. It’s only been five months since we received the title and registration to the boat in the mail. That’s when it became legal. That’s when we became real owners of the 1971 Larsen Shark. We’d spent an entire summer attempting to prove ownership; and with the delivery of the envelope from the Virginia Department of Game and Inland Fisheries, we took our two inch thick folder filled with copies of old registration, previous owner’s address, bill of sale, New Jersey DMV forms, online change of ownership forms, certified returned letter to previous owner, official letter from the VDGIF and our temporary registration from Walmart, and put it in a drawer for safe keeping. We really wanted to burn all that paperwork and do a dance around the bonfire, but were just too afraid to chance it. We thought the official letter might be a dream. After all, the lead up had been a nightmare. “She’s all ours now though,” I said. We sat in the truck, the boat resting on the trailer behind us, bright, refurbished and naked other than her New Jersey identification number. We threw out suggestions to each other. Bruce liked “A Fish Tale”, “Southern Comfort”, and “Crack of Dawn” (which I did not find funny). I punched his shoulder and made my own suggestions, “Dream Boat”, “Hook Line and Sinker”, “Irish Wake”, and I liked the ones named after women. Most of the boats we saw were white. Three sported a red stripe and one was a light blue. None we saw were bright spring green, only ours. Built in 1971, our vessel was obviously made during the age of Aquarius. We had a hippie boat. We started brainstorming slang from the 60’s. Words like cool, square, peace, man, far out, a gas, stoned, bummer, drag, flower child, funky, pad, right on, groovy. I floated the name to my group of literary friends. The graphic artist of the bunch drew up some curvy letters and we were hooked. 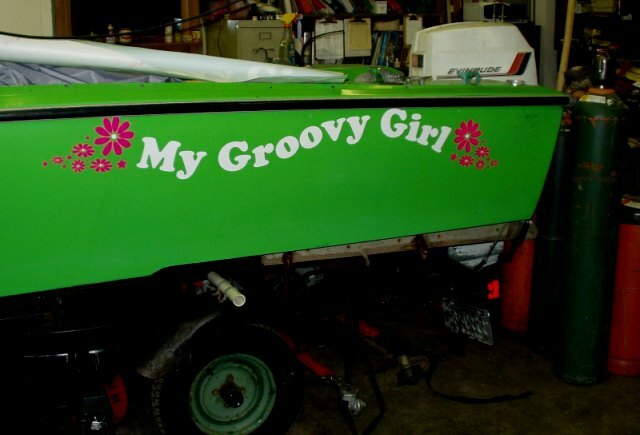 I ordered the marine grade vinyl decals the next day, and my boat name was ready for application by the end of the week. No amount of whining, cajoling or bribery worked. I’d have to wait until he was ready, or I could attempt the job myself. I’m a weenie. I waited. I hadn’t thought of the decals since the week after I picked them up from the sign place. Bruce has been cleaning the garage because it’s been too rainy to work outside. “Where’s the boat name?” he asked me yesterday. “Right here where they’ve been since September,” I said, pointing to the cardboard tube in the corner of the bedroom. “Bring it down to the garage. Let’s see if we can get it on the boat,” he said. 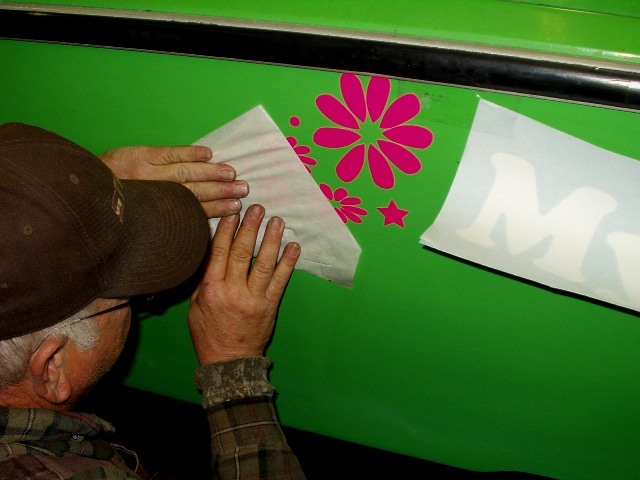 We cut on the dotted lines, peeled the backing, lined up the letters, pressed, prayed, and peeled the wax covering off the decals. When we finished, there was “My Groovy Girl”, no longer naked and un-named. She’s official now, and she’s ours. We have the paperwork to prove it. “All we need is champagne to christen her,” Bruce said. The problem with giving my husband too much credit for a job well done is that he takes over my project. After I found this sad little kitchen cabinet on the porch of a local antique shop and Bruce talked the owner down a hundred dollars from the asking price, I guess he felt like his bartering skills gave him special privileges. We stopped off at the hardware store on our way home with the cupboard to pick up some sandpaper blocks and a putty knife I wanted. I planned to scrape the curling peels of paint and sand down the finish to a “distressed” look. I saw the end result in my imagination. Sometimes I don’t have the words to describe what I want. It takes action to reveal my intention. “You want to do what?” Bruce asked. “Why don’t we just refinish it?” Bruce asked. Bruce and I have refinished our share of furniture. It’s hard work, scraping, sanding, applying chemicals that burn your hands and your nose, that ruin your favorite knock-around clothes. I have a love for primitive pieces though, and we have rebuilt jelly cupboards, lingerie chests, dressers, wardrobes, and farm tables. My favorites are the pine pieces we’ve refinished with their warm tiger stripe grain glowing a soft golden brown when rubbed with tung or linseed oil. With this project, I didn’t feel up to the intensive labor involved in stripping it. Besides, this was the cabinet I fell in love with, not some undressed version in Bruce’s imagination. He bent down and looked under one of the shelves. “Might be pine,” he said, plying me with possibility, but I was trying to stand firm in my conviction. I really liked the distressed look of the kitchen cabinet, and that weary façade enhanced the chicken wire covering the areas where there was once glass. “No, that’s alright. I’m going to work on scraping and sanding. You go ahead and work on that lawnmower carburetor over there.” Bruce shrugged his shoulders and turned to his workbench, picked up the carburetor, his screwdriver, and began working on the hunk of metal in his hand. I took up my putty knife and began scraping the curls of paint. When all the loose paint was chipped off, I took the coarse sandpaper block and started the back and forth rubbing that softens the edges of chipped paint. The emerging hints of wood beneath shone gray under the paint. A fine white dust powdered the floor under my ministrations. After three hours of sanding, the bottom of the cabinet was looking like I wanted it. I stood back, pushed my hair off my forehead with the back of my hand, rolled the tension out of my shoulders, and wiped my dusty hands down the front of my jeans. I turned to Bruce who was putting the carburetor back on the lawnmower. “What do you think?” I asked. “Can’t see a whole lot of difference from here,” he said, getting up and walking over. He reached out and ran his hand over the sanded areas. “Ok, I see what you’re doing. And you like the way this looks?” He asked with a frown. Bruce bent down and lifted his glasses to peer under them. “Look, the paint’s a lot thicker on this part. I don’t think it’s going to feather like you want it to,” he said, chipping at a small crater with the putty knife. “We’ll see,” I said. “Anyway, I think I’m done with it for today. I have the funeral to go to in South Hill tomorrow. I’ll work on it again Monday.” My best friend Trisha’s mother had died and the service was three hours away. I left for the funeral the next morning and didn’t think much about my little cabinet in the garage until I pulled back into the driveway late that evening. The light was on in the garage, and the door was open. I smelled the high-inducing fumes of lacquer thinner. I felt my stomach drop as the realization and dread filled me. I took a deep breath and looked through the door. There was my cabinet, turned on its side with my husband bent over it, covered in paint dust. He looked up at me and grinned with his excitement. I stood there stunned, absolutely stunned. It was like coming home to a room whose walls had been a familiar white to find them painted purple. I couldn’t speak. All I could do was stare. “ I’d have gotten more done, but I thought you were going to be gone longer,” he said. What could I tell him? That I wanted to cry? That I wanted to ask him what in the heck he thought he was doing? That I wished he’d stuck to repairing his lawnmowers and left my cabinet alone? That I wanted to turn back time and give his free day back to him again? That I hated what he’d done? Half of the cabinet was down to its natural wood. All the chicken wire had been pulled loose and was in a tangle on the garage floor, and Bruce had worked the whole day on the cabinet…for me. He was happy. He thought I’d be happy. “I’ve been thinking,” Bruce said. From the looks of it, he’d been doing more than thinking. “Yeah?” I asked. “Are you OK?” he asked, looking at me and frowning. “I’m OK, just tired. It was a long trip and just such a sad day,” I said. Bruce isn’t one for funerals or emotion. He doesn’t talk about his feelings or ask me about mine much. He does tangible things to show his love and support, like refinishing a piece of furniture. “I really hadn’t thought beyond sanding it,” I said. Yep, tomorrow, I thought. We’ll have to figure this mess out tomorrow.